Form and injuries restricted Dylan Buckley to just one senior appearance in 2017. Youngsters Dylan Buckley and Nick Graham sign new deals to stay in the navy blue. Dylan Buckley stepped up in the latter half of the 2016 season to make his presence felt. After a slow start to 2016, the son of Carlton's triple premiership great Jim Buckley finished the year strongly. Spent a fair part of the season at VFL level before regaining his senior spot for the final seven games - highlighted by his performance in the Round 22 win against Melbourne, gathering 12 disposals and kicking three goals. Has plenty of pace and has penetration in his kicking. Given a one-year contract contract at the end of last year and will be looking to establish himself as a regular senior player. 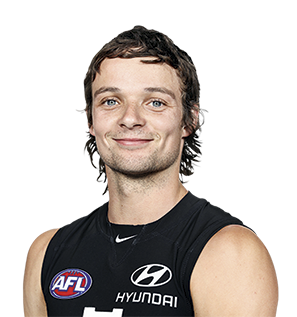 Draft history: 2011 NAB AFL Draft 3rd round Father/Son selection No.62 overall.